Bunching…boiling your goals down to the common denominator, make it simple stupid….all go through my head when goal planning. You got to have goals, you have to write them down, you have to look at them at least once a week…you have all heard that and it is correct. What they don’t tell you is that it is easy to become overwhelmed and feeling lost because of the work on your plate. I was the best in real estate because I focused on the most important aspect, let me explain. My goals of riches, property, free time, giving were all made easier with net profit cash flow. I needed cash for down payments, I needed cash to buy free time by hiring assistants to house keepers, I needed cash to give or hire people that could give…It seemed that most (not all) of the goals were made easier with cash. Cash came from closings, closing came from buyers, most of my buyers came from my listings and most of my listings came from effective lead generation systems….that was the nexus, the start. Sure I had to smell good and care about my clients but it really started with finding a seller that needed my services. Therefore, I became a heat seeking missile, looking for a listing presentation. Therefore every year I started 10 new ways to find a seller, cut the costs in doing so, be more efficient in doing so, and effecting the seller’s life for the positive. I became so passionate about it that I became very good at it…some say the best. Heck, my products that I sell started out as my original goals, that turned into systems, that turned into manuals and checklists, that turned into the best real estate products ever written. (ok, short commercial: It worked so well that I slowed down real estate brokerage and started speaking and selling my manuals. I upgraded the manuals every year for 30 years. Real estate groups hired me to come speak to them all over the world. I sold them my library of manuals, cd’s and dvd’s for $1500.00 us. Travel is tough and I am getting old so last month I stopped traveling and now just manage the real estate that I bought for myself. I have a warehouse of product wrapped in cellophane, brand new, ready to go out. About 7000 pages, all the software. The best (how to get rich) in real estate products in the world, go look at them here) because while they last and they will never be printed again I am selling them for $90.00 my cost. 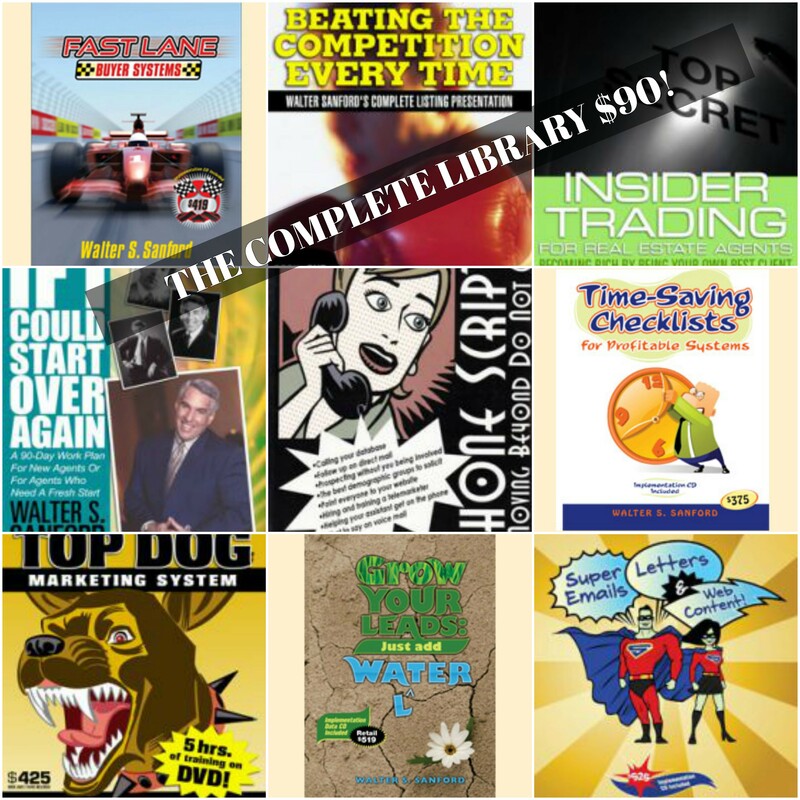 You will have the best real estate library for recruitment, production, systems that will make you rich, but only while they last. When they are gone, they are gone. (end of commercial). So the goal was simple every year. Find 10 new ways to find sellers, cheaply and efficiently and change their lives so that they would tell others. This one goal effected every other part of my life that I wanted to improve. I had more money, more free time, I could give to my church and my family, friends. I could bump into a nice “deal” and buy it, I was less stressed and nicer to everyone. Simple….one goal every year that made me into a real estate missile. Oh, one more goal, I wanted to follow Jesus but how can you follow if you don’t his teachings well enough. So my second goal was to study the Bible. Time blocked study. My third goal was health…yeah kinda tied into the first one…health is wealth. So now I only had three goals. Sure there were some sub-goals, but three biggies. It was easy to concentrate. Easy to implement. And when I made improvements it made monumental changes in my life and others. So make it simple this week for 2018 and move the big pieces first. And remember, if you or someone you know needs help, spend a few bucks and get that box of 45 pounds of books and software and add one more goal….a page a day.